The penultimate child of a family of 14, Poliakoff’s father bought horses for the Tsar’s army and, by the end of his life, had also acquired a stable of race horses. The Revolution forced the young Poliakoff to leave Russia at the age of 13. He decided to accompany his aunt Nastia, an internationally known performer of gypsy songs and the repertory of ‘Holy Russia’. Himself an exceptionally gifted musician, he accompanied her on the guitar and played solos in an orchestra of balalaikas. The troupe performed in Constantinople, Sofia, Belgrade, Berlin, Cologne and Dusseldorf, before turning up in Paris in April 1923. The young man, dazzled by the capital, refused to continue their tour on the other side of the Atlantic and remained in the capital. Until 1951, for 28 years, Poliakoff lived almost entirely thanks to his guitar, playing in cabarets such as the Shéhérazade or Casanova, going to bed at five in the morning, sleeping until midday and then, stimulated by several glasses of vodka, painting until the evening. In 1929 he often worked at the Grande Chaumière. In 1931 he took part for the first time in a group exhibition at the Galerie Drouant, mentioned in all the newspapers of the Russian émigré community. Practically no works remain from this period. In 1933 he attended classes at the Académie Frochot in Montmartre, where he was taught by Friesz, Cosson and Yvan Cerf. For 10 years he painted nudes in the manner of Velasquez. He stood in for Elvire Popesco on the guitar playing Tovaritch at the Théâtre de Paris. Shortly before his departure for England he developed an enthusiasm for the Italian Primitives, whom he discovered at an exhibition at the Petit Palais. In London in 1935 he attended classes for two years at the Slade School of Art. He delighted in the Egyptian sarcophaguses at the British Museum and also in the illuminated manuscripts at the Victoria and Albert Museum. He participated in several films as a guitarist. He married Marcelle Perreur-Lloyd. On his return to Paris in 1937 he met his compatriot Kandinsky, who had been living in Paris since the closure of the Bauhaus. The following year he showed a first abstract painting at the Galerie Le Niveau, causing the famous older artist to state: “For the future, I’m backing Poliakoff”. He had his first solo exhibition at the Galerie Zak. In 1938 he met Sonia and Robert Delaunay, whom he visited once a week. Delaunay explained to Poliakoff his theories on simultaneous contrast. At about the same time he met Otto Freundlich, who made a great impression on him. Although his predecessors accelerated his passage from figurative to abstract work, his painting was not influenced by them. He received the Mitty Goldin annual prize awarded to young artists from the director of the ABC Théâtre. His highly schematised work appealed to Despiau, Van Dongen and Gromaire, who were part of the jury. In 1939 he showed a work at the Salon des Indépendants, in which he participated until 1946. In 1945 Poliakoff’s first exhibition of abstract paintings was held at the Galerie L’Esquisse. 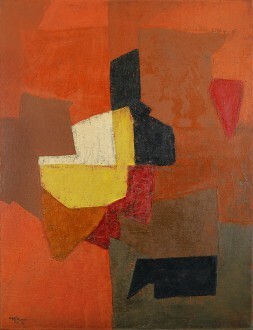 In his catalogue introduction François Chatelet wrote: “For Serge Poliakoff, abstraction is not dryness; the impasto with which he kneads his paintings is never in his opinion rich enough for him.” He sent a painting to the Salon des Réalités Nouvelles, remarked upon by the critic Guy Dornand. From 1946 onwards Poliakoff became part of the avant-garde of abstract painting. He figured on two occasions (at Domela’s request) in exhibitions held at the Centre de Recherches on rue Cujas: the first of these served to illustrate Herbin’s talk on L’évolution de la peinture, and his work was hung next to Marie Raymond’s and Engel-Pak’s; the second, given over to gouaches, drawings and watercolours, was related to a talk given by Wilheim Uhde on La métaphysique grecque et la physique moderne comme fondement dans l’humanisme nouveau and included Kandinsky, Herbin, Domela, Dewasne, Deyrolle, Hartung, Marie Raymond and Schneider. Lastly, an exhibition was the occasion for a collection of lithographs D’un art abstrait (published by Opéra) prefaced by Charles Estienne, which included Del Marle, Dewasne, Deyrolle, Domela, Engel-Pak, Fleischmann, Hartung, Miesztrik de Monda, Poliakoff, Schneider, Warb and Marie Raymond. His entry to the Salon des Surindépendants attracted the attention of Charles Estienne, who wrote in Combat: “Let us salute Poliakoff’s success; he paints paintings as gaily coloured as a carpet from Bukhara or Samarkand.” Poliakoff, anxious not to fall into a decorative style of painting, put an end to his bright colours, and his palette began to darken. He no doubt felt the influence of the fabric designs he executed to live on and which were extremely successful. He therefore stopped making these designs, although he continued to play the guitar at night. In 1947 he joined the Galerie Denise René and, in May, his work was exhibited alongside Duthoo, Poujet, M. Raymond and Reth. Poliakoff was awarded the Kandinsky Prize for the second year of this distinction. In 1948 he participated in a number of group exhibitions at the Galerie Denise René: in January Sculptures et peintures contemporaines presented by Charles Estienne and Léon Degand, who spoke of Peinture ancienne et peinture moderne; in April Duthoo, Poliakoff, Jacobsen; and in the autumn Tendances de l’art abstrait organised by Charles Estienne. The Galerie organised his first exhibition abroad, at the Tokantene Gallery in Copenhagen, which was run by Gauguin’s grandson, with a catalogue introduction by Reidar Revold. He also exhibited at the Haaken Gallery in Oslo. The Musée de Grenoble acquired a painting from him, the first work by Poliakoff to enter the state’s collections. There was a further series of group exhibitions at the Denise René Gallery. In 1949 Quelques aspects de la peinture présente, in 1950 Quelques aspects de l’art d’aujourd’hui, Espaces nouveaux and, at the end of the year, a presentation of the winners of the Kandinsky Prize since its creation in 1946: Dewasne and Deyrolle, Poliakoff, Max Bill, Marie Raymond and Chapoval, and in 1950 Mortensen. The Galerie Denise René held another exhibition of Poliakoff’s paintings in 1950 and the Galerie de Beaune showed his gouaches. In 1951 an exhibition of his recent works was held at the Galerie Dina Vierny, with a catalogue introduction by Charles Estienne, who wrote: “Painting the strength and originality of which are to unite the most affirmed modernism with quality, possesses the most evident and the most generous pictorial quality… how can we not react immediately… to this innate need, this almost infallible instinct for colour and this mysterious sense of life… Poliakoff is totally abstract: but he does not content himself, either, with being non-figurative: he offers us forms, real forms… which disturb and move us as can only do signs that refer to the profound poetic world buried in us, like a second nature.” He participated in the group exhibition held by the Galerie Denise René: Klar Form, 20 artistes de l’École de Paris, which travelled in Belgium and Scandinavia. Poliakoff’s work was already beginning to attract loyal collectors, and he was able to spend 1952 working entirely on his painting thanks to a contract with the Galerie Bing. He exhibited abroad at the Galerie Ex-Libris in Brussels, the Circle & Square Galleries in New York run by Jean Larcade (this was his first solo exhibition in the USA) and at the Kunsthaus in Zurich; he also took part in several exhibitions of avant-garde painting organised by Charles Estienne, which are today considered historic: in February at the Galerie de Babylone with La Nouvelle École de Paris; Rose de l’insulte at the Galerie La Hune, and at the Premier Salon d’Octobre, in the Salle André Baugé. He was also invited to the second Salon d’Octobre in 1953. He spent the summer at Gordes, staying with his friend Charles Estienne, and painted a wall painting in the latter’s house. At the exhibition L’Art du XXe siècle presented by the Musée d’Art Moderne de Paris, he saw two paintings by Malevitch from the collections of the Museum of Modern Art in New York, including Carré blanc sur fond blanc. This encounter gave him a shock, which reinforced his opinions: “It showed me once again the capital role played by the vibration of matter. Even if there is no colour, a painting in which the matter vibrates remains alive.” In 1959 Poliakoff was equally impressed by the major Malevitch exhibition at the Kunsthalle in Bern. In 1953 Poliakoff was discovered by the general public, with his first major exhibition (45 paintings and five gouaches) held in Liège at the APIAW (Association pour le Progrès Intellectuel et Artistique de la Wallonie), then at the Palais des Beaux-Arts in Brussels and at the Musée de Verviers with a catalogue introduction by Robert Vrinat. This was followed by an exhibition at the Galerie Evrard in Lille. From 1954 onwards his exhibitions became more frequent. In Paris: Galerie Bing in 1954, with R.V. Gindertaël writing: “Two laws: architectural harmony and sensitive rhythm, Poliakoff expects his work to be logical and disciplined beneath an appearance of spontaneity and freedom,” and recalled the artist’s definition: “Abstract art comes from inside and goes further inside” (Cahiers d’Art, 1954, Vol. II). Writing about Poliakoff’s painting in 1956, Julien Alvard employs the term ‘stone art’: “ageless… hence the frequent archaeological character” (XXe Siècle, June 1956). 1957 Galerie Creuzevault (paintings), with a catalogue introduction by Jacques Lassaigne, who also wrote for the exhibition of gouaches shown at the Galerie Berggruen. The critic remarked: “Poliakoff has a taste for superb textures that he lays in successive layers that enrich each other; it seems that he attaches increasing importance to the stroke which fans out from a centre.” 1959 Galerie Berggruen and Galerie Knoedler, with prefaces by Christian Zervos, Galerie Cahiers d’Art, which also published a monograph by Dora Vallier, in which we read: “Fixing the pictorial space on the surface of the canvas, in the immobile journey of a colour. Modulate.” The same year Franz Meyer wrote an article, La technique de Poliakoff, in the review XXe Siècle (May–June 1959). When Poliakoff painted a painting, he drew a network of lines directly on the canvas, which he said corresponded “to his golden number”. He then looked for the values, which sometimes led him to alter the initial composition. He painted in three or four successive layers. He made his colours from English powders, mixing them on a plate of glass and keeping their dosages secret. He was unconcerned by comfort. After the cramped apartment in rue du Vieux-Colombier, which had also served as a studio and where he lived with his wife and sons, he worked for a time in a studio in rue Bonaparte. Poliakoff talked to Julien Alvard for the latter’s album Témoignages pour l’Art abstrait (with Gindertaël, Art d’aujourd’hui, 1952) about his approach to his work. Further Paris exhibitions in 1963 at the Galerie Le Divan, in 1964 at the Galerie de France, with a preface by Jean Cassou, and in 1965 at the Galeries Dina Vierny and La Hune. In 1954 Poliakoff showed at the Martinet Gallery in Amsterdam and the Der Spiegel Gallery in Cologne. In 1955 he exhibited at the Knoedler Galleries in New York, with a catalogue introduction by Christian Zervos, and the Galerie Dupont in Lille (with a talk by Jean-Paul Aron for the occasion). In 1957 he showed with the Galleria del Naviglio in Milan, with a catalogue introduction by Gualtieri di San Lazzaro; Moderne Galerie Otto Stangl in Munich, with a catalogue introduction by Franz Meyer. 1958 the Kunsthalle in Basel, with a catalogue introduction by F. Meyer; the Kunstverein in Hamburg, with texts by Alfred Hentzen and Albert Schulze Vellinghausen; the Hanover Gallery London, with a catalogue introduction by John Russell; Galleria d’Arte Selecta in Rome, with a preface by Gualtieri di San Lazzaro, who also wrote for an exhibition at the Galleria del Naviglio in Milan; Galleria del Cavallino in Venice; Statens Museum for Kunst in Copenhagen, with texts by Jorn Rubow and Erik Andreasen; the Kunsthalle in Dusseldorf, with a text by Ewald Rathke. The same year Jean Grenier wrote a study in the review L’Œil (no. 39 March). 1959 Loan Exhibition of Paintings by Serge Poliakoff at The Phillips Collection Washington DC. In 1960 the Kunsthalle in Bern, with a text by Franz Meyer; Gallery Marya Copenhagen; Svenska-Franska Konstgalleriet in Stockholm and again in 1962. 1962 Im Erker Gallery in Saint-Gall with texts by Will Grohmann and Dora Vallier; Haaken Gallery, Oslo; Galerie Bonnier, Lausanne. 1963 Galerie Cavalero, Cannes. The first retrospectives were held in the same year: the Kestner Gesellschaft, Hanover, with a text by Wieland Schmied; the Whitechapel Art Gallery in London, with a text by John Russell; the Kunsthalle in Bremen; the Museum am Ostwall in Dortmund; the Overbeck Gesellschaft in Lubeck. In 1964 the Haus der Stadtischen-Kunstsammlungen, Bonn; the Wurttenbergischer Kunstverein in Stuttgart, with a text by Wieland Schmied; the Stadtisches Museum Treves, and an exhibition at the der Spiegel Gallery in Cologne, with a text by Albert Schulze Vellinghausen; the Scott-Fauré Gallery at La Jolla in California, with a text by Scott Youmans; the Lefebre Gallery in New York, with a text by Franz Meyer. In 1965 the Flaviana Gallery in Locarno, with texts by Jean Cassou and Hanns Theodor Flemming; the Galerie Raber in Lucerne, with a text by H.T. Flemming; the Im Erker Gallery in Saint-Gall, with texts by H.T. Flemming and Ottomar Domnick. There have since been numerous exhibitions both in France and abroad, which continue to this day. A complete list is given in the catalogue published by the Galerie Melki, 1991. At the same time Poliakoff participated in group exhibitions and in major international exhibitions: with the Galerie Denise René in 1953 and 1954 Tendances actuelles de l’École de Paris at the Kunsthalle in Bern, at the École des Beaux-Arts in Sarrebruck with Bloc, Deyrolle, Istrati, Leppien, Mortensen and Kandinsky, at the APIAW in Liège with Bloc, Dewasne, Deyrolle, Herbin, Mortensen and Vasarely; in 1955 the Museum of Modern Art in Rio de Janeiro. In 1955 in Éloge du petit format, organised by Michel Ragon, at the Galerie La Roue in Paris, and again in 1956; Trente peintres de la Nouvelle École de Paris at the Galerie Craven in Paris. In 1956 L’aventure de l’Art abstrait by Michel Ragon at the Galerie Arnaud in Paris. Poliakoff figures with Atlan, Soulages, Schneider and others in Trompe-l’œil, Michel Ragon’s first novel, which takes place among the abstract artists who appear in it under their real names. 1957 50 années de peinture abstraite at the Galerie Creuze-Balzac in Paris at the same time as the publication by Hazan of the Dictionnaire de Peinture abstraite by Michel Seuphor; Expression et non-figuration organised by Michel Ragon at the Galerie Le Gendre in Paris. Poliakoff participated in the Salon de Mai in 1946 and 1950. Invited by Documenta II in 1959 and III in 1963 at Kassel; participated in l’École de Paris at the Galerie Charpentier from 1954 to 1958. Exhibition of Contemporary Painting, Carnegie Institute in Pittsburgh. 50 ans d’Art moderne in Brussels. Naturalised a French citizen in 1962, he took part in the Venice Biennial, where a room was given over to his work for a retrospective covering the previous 20 years. In 1965 he was awarded the International Prize at the Tokyo Biennial and, in 1966, the Grand Prix de la Biennale de Menton. The same year, a major retrospective was held at the Kunstmuseum in Saint-Gall (Catalogue, text by Franz Meyer) and in 1968 a retrospective at the Maison de la Culture in Caen (talk by Dora Vallier). In 1958 he designed the stage sets for Marius Constant’s ballet Contrepoint, choreographed by Roland Petit. In 1959 two of his paintings were projected to serve as a decor for Jean Tardieu-Jacques Poliéri at the Théâtre de l’Alliance Française in Paris. 1970 Poliakoff. Musée National d’Art Moderne, Paris. Catalogue Dora Vallier and Jean Leymarie. 1975 Retrospective of the Graphic Work. Kasseler Kunstverein, Kassel. 1987 Rétrospective. Fondation Pierre Gianadda Martigny. Catalogue texts by Dora Vallier and Marie-Victoire Poliakoff. 1991 Rétrospective. Galerie Melki Paris. Catalogue text by Dora Vallier. Biography, bibliography. Poliakoff’s work figures in the collections of many museums including: Paris, National d’Art Moderne – Clermont-Ferrand – Colmar – Lille – Nantes – Paris – Toulouse – Amsterdam – Basel – Berlin – Bonn – Brussels – Buenos Aires – Chicago – Copenhagen – Essen – Geneva – Hamburg – Helsinki – Liege – Munich – New York – Oslo – Rio de Janeiro – Sao Paulo – Tel-Aviv – Tokyo. Michel Ragon: Poliakoff. Le Musée de Poche, G. Fall, 1956. Jean Cassou: Serge Poliakoff. Bodensee-Verlag, Amriswil, 1963. Alexis Poliakoff: Serge Poliakoff, les estampes, Arts et Métiers graphiques, Paris, 1974. Giuseppe Marchiori: Serge Poliakoff, Les Presses de la Connaissance, Paris, 1976. Gérard Durozoi: Poliakoff, L’Autre Musée, La Différence, 1984. Françoise Brütsch: Serge Poliakoff, œuvres 1923–1969, Ides et Calendes, Neuchâtel, 1993. Alexis Poliakoff, Serge Poliakoff, Catalogue raisonné, vol. II, 1955-1958, Archives Serge Poliakoff/Edition Galerie Française, Paris/Munich 2010. Alexis Poliakoff, Serge Poliakoff, Catalogue raisonné, vol. III, 1959-1962, Archives Serge Poliakoff/Edition Galerie Française, Paris/Munich 2011.